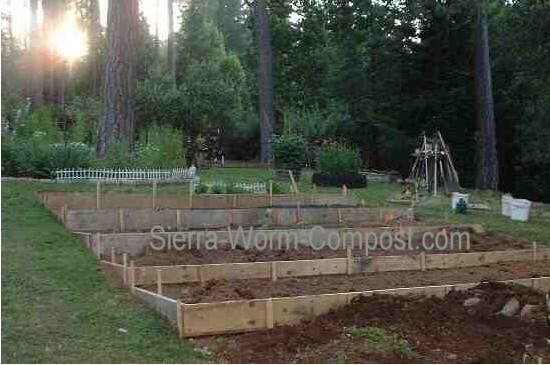 A good garden layout is one of the most important factors for strong plants and a plentiful harvest. The first consideration to the layout is your geographic area. Check here for your growing zone. The most northern states and New England areas of the country have shorter growing seasons which means a garden layout there has to be situated to receive the maximum amount of sunlight in a shorter time period. Unless you are in a mountainous region, also with a shorter growing season, the rest of the country would fall into a growing season of 5-6 months, on average. Frost date and putting garden to bed. I have started using the GrowVeg online garden planning program on their free 30-day trial just to see what it could do. I'm loving it and will be signing up for the paid version. I wish I had this years ago! Spending a day in your garden in early Spring, Summer and Autumn to actually note how much full sun you receive and in what spots, is critical. Assuming you have enough sun by looking out the window at 11am is not enough. If you have children that are old enough, this would be a good week-end project they could do and involve them in the gardening experience. If your layout only gets 4-5 hours of full sun, you should be able to grow most leafy-green veggies, berries, beans, potatoes and root veggies. Any of the sun-loving plants listed below can be planted, but your harvest will be disappointing, with spindly plants and little produce. A general rule of thumb is that plants grown for their stems, leaves or buds generally tolerate light shade fairly well. Those grown for roots or fruits tend to need more sun. Having 12 hours of unhindered sunlight is the ideal garden layout. However, that also poses some problems for succession planting. A early fall harvest of lettuce or other greens would need to inter-planted among the taller veggies to provide heat relief. Growing cucumbers or squash on a garden screen made from bamboo poles or wooden stakes attached to chicken wire makes a great "sun shelter" for crops that like it cooler. A second consideration in your layout includes the unintended shading of your gardening beds by fences, tall trees (when planting keep 10 ft away from any tree), roof lines or buildings that may end up putting your plants in part or all shade. 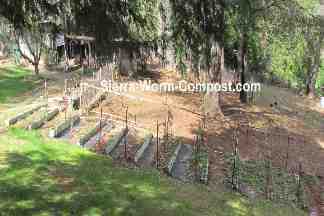 The rule for planting on an incline is terracing the slope in order to plant across it . Planting downhill will cause water ridges to form during irrigation or rainy periods leading to soil erosion and washing out the plants. Putting the beds in a north/south position for a slope isn't a problem if plant heights are shortest at the bottom and tallest at the top. 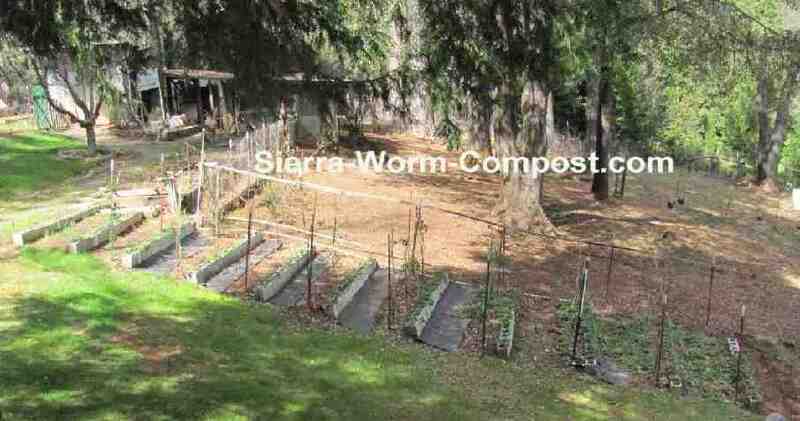 Blackberries being planted down the hill, retaining walls of cinder blocks with strawberries planted in the blocks. 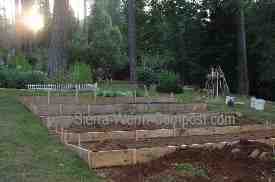 Taking the time to evaluate your garden layout will pay big dividends at harvest.